Queen's Gambit Accepted or Declined? Chess2u » General Topics » Queen's Gambit Accepted or Declined? 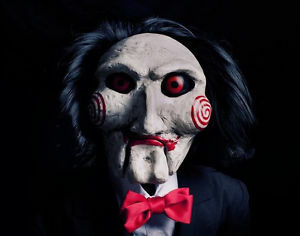 Jigsaw Killer: "Let's play a little game"
In a Queen's Gambit theme, if you could play a chess engine configured to equal your playing strength, which variation would you choose for the Black pieces? As Black's 2...dxc4 surrenders the centre, White will try to seize space in the centre and use it to launch an attack on Black's position. Black's game is not devoid of counterchances, however. If the white centre can be held at bay, Black will try to weaken White's centre pawns to gain an advantage in the ensuing endgame by playing ...c5 and ...cxd4 at some stage, and if White responds with exd4, the result will be an isolated pawn on d4 – which can also lead to a keen middlegame battle. If White recaptures with a piece at d4 instead, the centre will be liquidated and a fairly even game will usually ensue. Playing 2...e6 releases Black's dark-squared bishop, while obstructing his light-squared bishop. By declining White's temporary pawn sacrifice, Black erects a solid position; the pawns on d5 and e6 give Black a foothold in the center. 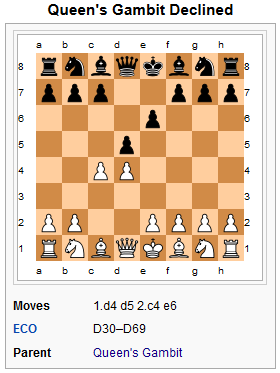 The Queen's Gambit Declined has the reputation of being one of Black's most reliable defenses to 1.d4. In this situation, White will try to exploit the passivity of Black's light-squared bishop, and Black will try to release it, trade it, or prove that, while passive, the bishop has a useful defensive role. 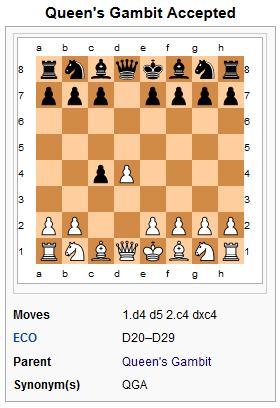 An eventual ...dxc4 by Black will surrender the center to White, and Black will usually not do this unless he can extract a concession, usually in the form of gaining a tempo, by capturing on c4 only after White has played Bd3 first. In the Orthodox Line, the fight for the tempo revolves around White's efforts to play all other useful developing moves prior to playing Bd3. Re: Queen's Gambit Accepted or Declined?